Dead Island's zombie apocalypse provides an unlikely pairing of serene environments and brutal encounters with the undead. Ever since its teaser trailer, people have been wondering just exactly what type of game Dead Island would be. The brief demo on the show floor didn't unveil all of the game's secrets, but we've played enough to know it's something special. In short, it's Dead Rising meets Fallout 3 on a scenic island. You take on missions (some optional, some required), savage items scattered about and beat the living hell out of zombies along your way. It's the game's tone and attention to detail that sets it apart, however. The combat and focus on melee weapons is similar to Dead Rising. You pick up paddles, cleavers and other items you come across in the game's world and use them to defend yourself. You can kick zombies, as well as attack directly or by throwing your weapon (which you then have to retrieve). From the first encounter on, the fights against the game's undead are horrifying. The way they latch on you to made me squirm. They grab a hold and nibble on you, until you shake them off with the triggers. They occasionally knock you down with a heavy attack, giving an opportunity for more zombies to gather round. Instead of running through hordes and knowing them down, I often chose to evade and fight strategically. This was partly out of fear, but the game's fatigue system also factored in the decision. Running and fighting drains your energy, which slowly replenishes. This is one of the key decisions that makes Dead Island a game based around exploration; this isn't purely a zombie hack-n-slash. As I made my way to an objective, I would often evade idle zombies as I prepared to face a group ahead. Even deciding to rescue a human character locked in a jeep was an uneasy call to make. The island's open environment occasionally offers multiple paths to get to a location. The scale is more reminiscent of Far Cry than Fallout 3, but there is plenty of fun to be had by exploring and seeing what you can get away with in the game world. 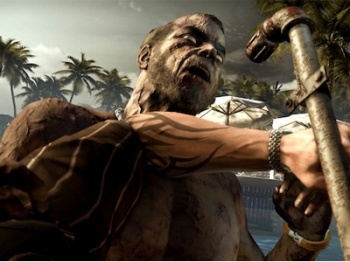 The game's excellent mini-map keeps the player from feeling lost in Dead Island's large and dangerous world. It curves and redirects you to your objective, as you explore and walk along new paths. The demo was short and sweet, but everything from the score that sounds like John Carpenter playing Caribbean tunes to the intense opening sequence has me excited for the full game. Dead Island might be the first zombie game to make me feel like I am truly in danger, as the player - even despite the clear blue sky and gorgeous beach surrounding the mayhem. Players will be able to find out for themsleves if this open-world zombie title lives up to the hype when it is released September 6 for all HD platforms (including OnLive).